To experience multiculturalism at its best on Canada Day or any day, find a supermarket with a bin of fresh okra. Lovers of the edible green pod were stocking up at my local No Frills recently, thrilled with the low price and excellent quality from the Dominican Republic. 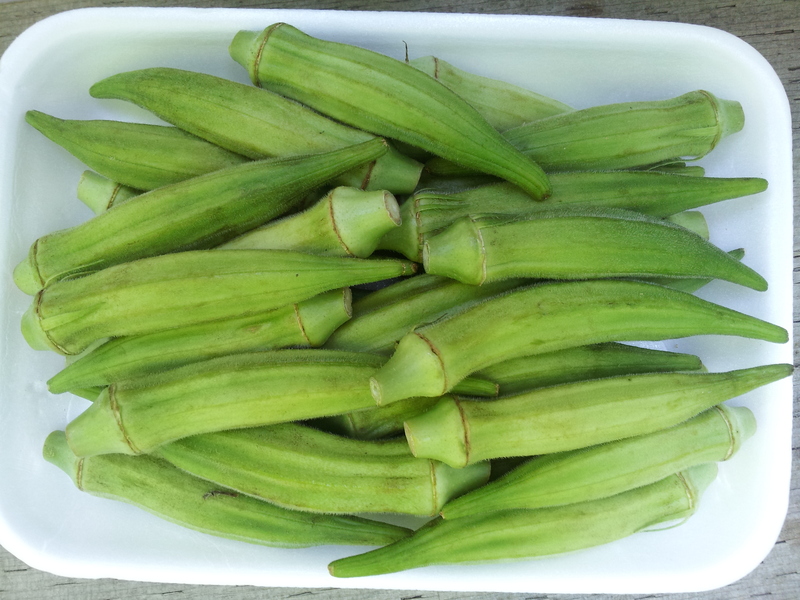 Small quantities of okra are also being grown in Ontario. Elbowing my way into the crowd, I asked the woman beside me how to choose the best ones. She looked around furtively then, with a Ssh!, showed me how she flicked the slender tip like a lighter. If it snapped off, she put it in her bag. Limp tips stayed in the bin. Another woman, who’d lived in India, was doing the same. Then a woman from China reached into the pile. Instead of flicking the bottom, she put her nail through the top of the pod to test for freshness. This is why more and more produce is being sold in bags! I felt like a criminal snapping tips, and switched to choosing short fat bright green pods, which was pretty well all of them. When I asked how to cook them, my new friends smiled. “We do so many things with okra!” said a woman from Trinidad, who was also buying several pounds’ worth of pods. She nodded approvingly as my first buddy gave me detailed instructions on cooking the mild-tasting pods with shrimp and a little soy sauce. A man from Greece joined in, voting for his wife’s okra with chicken. An American woman from Georgia said she loves okra sliced into rounds, coated in cornmeal and fried. And everyone agreed okra and tomatoes is a match made in heaven. Not one seemed the least concerned about okra’s reputation as a slime-fest when cooked. I walked to the cash thinking about how food brings us together no matter where we’re from, and feeling more confident about tackling this strange vegetable. Choose bright, smooth, unblemished green pods less than 4 inches (10 cm.) long. Eat as soon as possible, within a day or two. Refrigerate in a paper bag or wrap loosely in a plastic bag with a paper towel. In season July to September. Okra contains a clear, thick liquid that’s released when you slice or chop it. To minimize gumminess, fry or grill whole or cook with acidic ingredients such as citrus, tomatoes and vinegar. Okra loves tomatoes, onions, sweet peppers, eggplant and sweet corn. Steam or boil whole pods until tender, about 8 minutes. Serve cold with a vinaigrette or hot with lemon, melted butter and salt and pepper. Thicken soups or stews with sliced okra. Add in the last 10 minutes of cooking for a velvety texture. Gumbo with seafood or smoked sausage is a Louisiana favourite. Stir-fry whole or sliced okra on high heat in a little oil. Go Indian with onion, garlic, ginger, curry powder and cilantro. Grill whole pods, tossed in oil, on high heat until bright green with grill marks, 4 to 5 minutes. Turn and cook another 5 minutes until tender. Sprinkle with salt and lemon juice. Pickle raw okra with cider vinegar, garlic, dill seeds and pickling salt. In preliminary findings, French scientists report that okra extract stopped the spread of melanoma, or skin cancer, in mice. While nobody’s promising miracles just yet, we do know okra is super low in calories and a good source of Vitamin C and folate. Tomatoes, vinegar and searing the okra all combine to make this dish ideal for newbies. Cutting pods just before cooking also helps keep them slime-free. Heat 2 tbsp (30 mL) oil in large skillet over medium-high heat. Rub chicken with salt and pepper and cook until golden, 5 minutes per side. With tongs, transfer to a plate and keep warm. Add sliced okra to hot pan and cook 3 to 4 minutes, until bright green and charred, stirring twice. Transfer okra to plate. Reduce heat to medium and add remaining 1 tbsp (15 mL) oil to pan. When hot, add onion, celery, jalapeno and garlic. Cook 3 minutes, stirring occasionally, until onion is tender. Add tomatoes and cook 5 minutes to blend flavours. Stir in broth, tomato paste and vinegar, mixing well. Bring to boil and cook 10 minutes to reduce sauce. 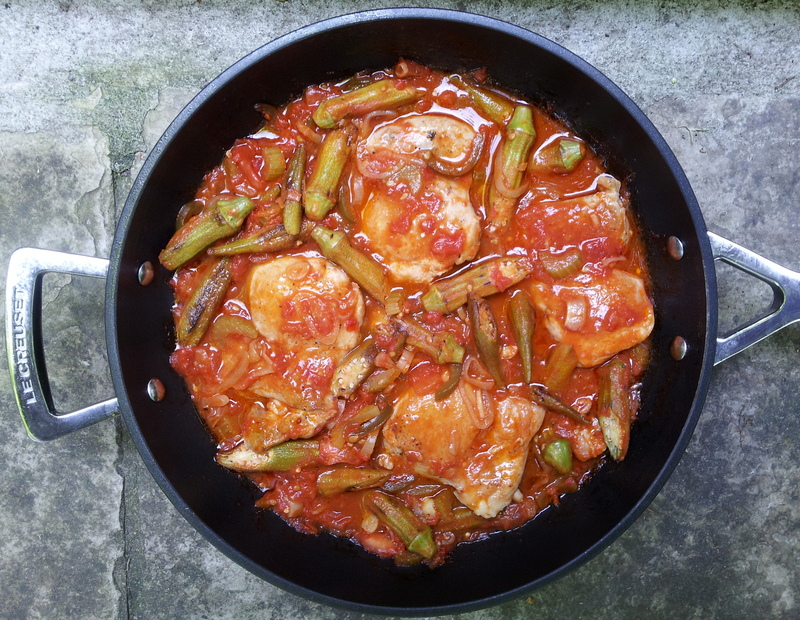 Return cooked chicken and okra with any juices to skillet. Reduce heat to low and simmer 5 minutes, uncovered, until chicken is cooked and vegetables are tender. Check salt and pepper. Serve over steamed basmati rice. *I prefer peeling tomatoes and peaches with a julienne peeler rather than dunking them in boiling water. Every other Thursday, Fresh Bites helps you tantalize your taste buds with out-of-the-ordinary produce. Thanks Judy! You’re right, we don’t think about how our poking and prodding leads to wasted food.As much as I hate it, packaging does keep produce fresh longer.